Joyful Noise Quartet invites you to Choctaw County Homecoming concert featuring the legendary Blackwood Brothers Quartet at Ackerman Baptist Church, Saturday, March 29, 2014 at 6:00 pm. There is no admission charge and an offering will be received for the quartet. The name “Blackwood Brothers” is a name synonymous with Gospel Music. Their music has been heard around the world on radio, recordings, television and in personal appearances. My introduction to Southern Gospel music came at the young age of 5 at Dale Davidson field in Ackerman. The occasion was a J.P. Coleman for governor political rally. The blending that day of southern fried chicken with live performance from The Blackwood Brothers Quartet and the political platform of candidate Coleman proved to be the right ingredients for successful election results. Though I was only a youngster, the gospel message musically styled in distinctive 4-part harmony by The Blackwood Brothers Quartet had an impact on me. The Blackwood family would continue as a profound influence in my life both musically and spiritually through Madeline Wood, daughter of Lena Blackwood Cain, the only girl in the first generation of Blackwood singers. Ackerman and Choctaw County have long been recognized as producing superior music students and it is no secret that the foundation was set by amazing musical skills of Madeline Wood who taught for many years in the school system and church. From the intercessory prayers of their mother, Carrie Blackwood, we discover the roots of the powerful legacy of the famed quartet. The quartet’s roots are Choctaw County in the Singing Schools of Vardaman Ray with their first official performance at Concord Baptist Church and introduced that day as The Choctaw County Jubilee Singers. Soon afterward, they became known as The Blackwood Brothers. The Blackwood Brothers Quartet was officially formed in 1934 with brothers Roy, Doyle and James along with Roy’s son, R.W., who was killed in a tragic airplane accident in 1954. Roy and Doyle retired from the road in the late 1940s. James continued to lead the group into the early 1980s, and over the years it has become the best-known name in gospel quartet history. The Blackwood Brothers have recorded over 200 albums and toured in 47 countries. They have won 8 Grammy Awards and 6 Dove Awards. They were inducted in the “Gospel Music Hall of Fame” in Nashville, TN in 1998. James, the last surviving member of the original quartet, went to be with the Lord in 2002, but his son, Billy, continues the 80-year family tradition of great gospel singing. The group today consists of Billy Blackwood, Wayne Little, Butch Owens, and Mike Helwig. The result is one of the best quartets you have ever heard. Billy, James Blackwood’s youngest son, sings baritone and is the music arranger for the quartet and also produced the latest CD for the quartet. Billy played drums for J.D. Sumner and the Stamps Quartet at the age of 14. He also played for the Blackwood Brothers, Gordon Jensen and Sunrise, and Andrus/Blackwood & Company and toured with Voice, the opening act for the Elvis Presley show. He has traveled in solo ministry and has worked in youth and pastoral ministry. Billy has four daughters, Brette, Britni, Emma and Ellie and one son, Will. He and his wife, Cherry live in Hendersonville, Tennessee. Wayne Little is one of the best tenors to ever sing a gospel song. Wayne formed the Crystal River Boys Quartet and later sang with former Blackwood Brothers bass singer, Ken Turner in the New Millennium Quartet. He was a featured singer at the Pentagon for a 9/11 Memorial service with Rev. Franklin Graham. His powerful, clear tenor voice thrills audiences from coast to coast. Wayne and his wife, Gina, live in Elizabethton, Tennessee, and have two sons, Micah and Maison. Mike Helwig sings lead in the quartet. He started singing gospel music at the age of 19. A Canadian native, he sang for Canadian groups The Torchmen and Unashamed. He won a Dove Award for Favorite Tenor from the Canadian division of the Gospel Music Association in 1997. Since moving to the United States he has sung with the Wilburns, the Stamps Quartet, the Dixie Echoes and Promise before joining the Blackwood Brothers. Michael and his wife, Leslie, have identical twin daughters, Eva and Laura and one son, Sam. Butch Owens is the newest member of the group, but is no stranger to gospel music. He sang bass with the Stamps Quartet for a number of years and most recently with Bob Jones and the Songfellows Quartet before joining the Blackwood Brothers. Butch is the kind of person who never meets a stranger and has many friends across the nation and around the world. He recently retired from the Jackson, Mississippi police department where he worked for twenty-five years. Butch and his wife, Margaret, live in Spring Hill, Tennessee. 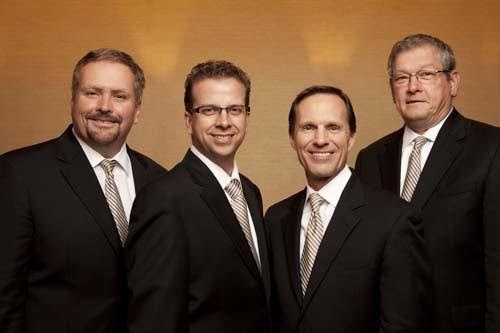 For more information on The Blackwood Brothers Quartet, visit www.BlackwoodBrothers.com. Grands March 2014 from Buddy Smith on Vimeo.